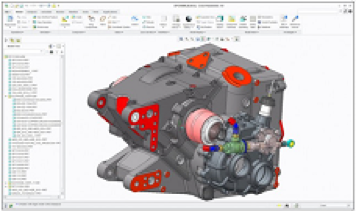 With the launch of Creo 2.0, there are now 10 stand-alone Creo apps, which are the backbone of the entire range. These core apps are fully interpretable, ideal for increased collaboration, but they all operate independently. For "history-based" parametric modeling, complete with direct and freeform capability. A standalone app CAD engineers who want direct interactions with the geometry. For "history-free" direct modeling. Is the analyst app. Used for thermal and finite element simulation. The app to create 2D routed systems diagrams, such as piping and cabling. An app for technical illustration. Full of tools for communicating model information concepts graphically in 3D. An app designed for those who want to view, interrogate, and mark up MCAD geometry. An app tailored to view ECAD geometry. Quickly capture freehand design ideas in 2D with this app. The app for early concept layout work in 2D, with the capacity of evolving the design to 3D.